We, D.P.Engineers are a reputed name for Manufacturing Variety of Air Filters & Air Conditioning Related Components.By providing clean air solutions to a large number of customers from power generation, refineries & petrochemicals, engineering, pharmaceuticals, food, beverages and allied industries, we have earned recognition in the market. The product range of industrial filters, we offer include Air Filter, Pre Filter, Fine Filter, Hepa Filter, Mini Pleat Hepa Filter, Bag Filter, Hi-Tem. 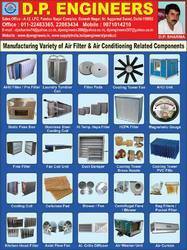 Hepa Filter, Air Pipeline Filters, Gas Pipeline Filters, Liquid Pipeline Filters, Pocket Filters, Vacuum Filters, Hvac Filters, Wire Mesh Filter, Fuel Filters, Microvee Filter, activated carbon filters,Rod Type Filter,Rod Type Pre Filter,AHU UNIT,Air Curtain,Air Washer,Axial Flow Fan,Cellulose Paper Pad, Fan Coil Unit, Fresh Air Unit,Grill,Damper, Diffusers, Motorized Dampers, Acrylic Inclined Manometer, Magnehelic Gauge, Pass Box, Cooling Tower Fan Hub, Cooling Tower Motors, Cooling Tower Packing Pall Ring, Cooling Tower Sprinkler,Cooling Tower Fan, Cooling Tower Spray Nozzels,Cooling Tower PVC Fills,Air Shower,Laminar Flow Bench,Sampling Dispensing Booth.Our company works under the leadership.